What a gifted group of writers I had the pleasure to work with in my Riggio Poetry Workshop at the New School. (Left to right lower row: Isoken Osagie, Ryan Delgado, Satya Hariharan, Tia Toney; standing: me, Mica LeJohn, Allan DeBoissiere, Danielle Gauthier, Didi Ntsie.). An honor to know them all and to immerse myself in their work. Alicia Ostriker and Martha Nell Smith—a former student of Alicia’s and the co-editor of Everywoman Her Own Theology: On the Poetry of Alicia Ostriker—celebrating at the Algoniquin. Martha Nell Smith and Julie R. Enszer, editors of Everywoman Her Own Theology: On the Poetry of Alicia Ostriker, at the Algonquin, November 2018. Gregory Pardlo and I attended the Graduate Center at the same time and gave a poetry reading together before we graduated. It was great to see him at the Stella Adler Studio reading he gave from Air Traffic, October 2, 2018. With Mary Crow, my first poetry teacher and former Colorado Poet Laureate, author of Addicted to the Horizon; I Have Tasted the Apple; Borders; and many works of translation, including Woman Who Has Sprouted Wings: Poems by Contemporary Latin American Women Poets. August 4, 2018.
with fellow-alum of the NYU Graduate Program in Creative Writing and author of Bed of Crimson Joy, Joan Poole. We're at the New School Jean Valentine Tribute, April 5, 2016. With Joan Larkin, author of Blue Hanuman, My Body: New and Selected Poems, and Cold River. April 5, 2014, Jean Valentine Tribute: front row, l. to r.: Anne Marie Macari, Joan Larkin, Elizabeth Metzger, Jane Mead, Mary Ruefle, Michael Burkard, Jean Valentine, Ocean Vuong, Patrick Rosal, Jeffrey Yang. back row, l. to r.: D. Nurkse, Mark Doty, Ross Gay, Brian Teare. Honor Moore--author of The White Blackbird: A Life of the Painter Margarett Sargent by Her Granddaughter--and Alice Cohen a the New School publications party, February 19, 2016.
with Star Black, author of six books of poems, most recently Velleity's Shade, photographer, and lifelong friend of the late Paul Monette's closest friend. Here we are at the New School's party to celebrate alumni and faculty works published in 2015 (February 19, 2016). with Alice Cohen at a New School University celebration of faculty and alumni publications, February 19, 2016. Alice's memoir, The Year My Mother Came Back, was published in 2015. With Paule Marshall--whose Browngirls, Brownstones was one of the first novels I read in Pattie Cowell's American Lit course at Colorado State--and Abena Busia. 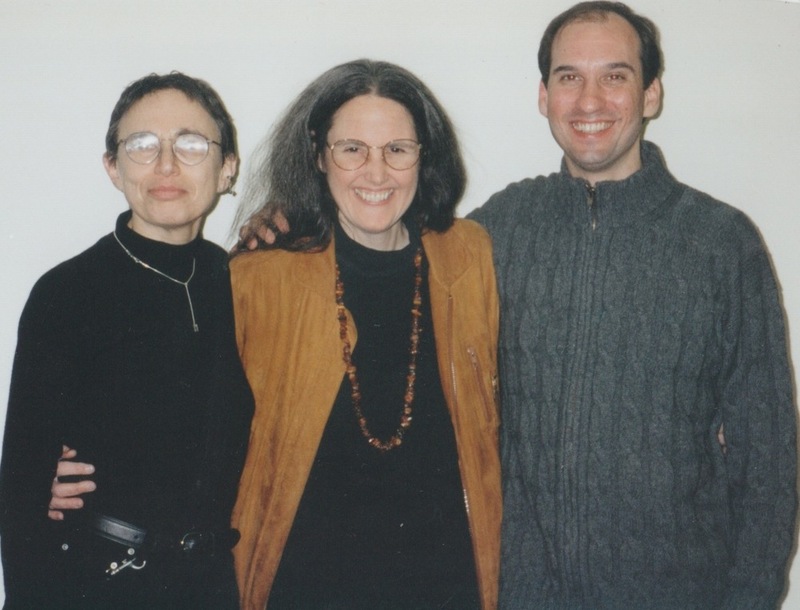 With Linda Gregg and Jack Gilbert. I first met Linda in a Rocky Mountain oyster bar n Greeley, Colorado. Her Too Bright to See has been a work my imagination continues to return to after all these years. I first met Jack--who has sadly passed on--at Linda's apartment. We're on our way to a poetry reading. with Jhumpa Lahiri, the youngest person to win the Pulitzer Prize. With Tim Seibles, Ruth Schwartz, and Sheryl St. Germain. With Jean Valentine, winner of the National Book Award. Peter Frampton, Portland, Oregon, 1979. My friend, Sondra Crippen, who was so obsessed with him that she found out his arrival time, is imploring me to take the picture. Timothy Liu, Michael Monlack, Richard Tayson, Steven Cordova, Michael Broder, and Jason Schneiderman. Maggie Anderson, former director of the Wick Poetry Center, and Victoria Redel, first winner of the Wick Prize. With Jason Schneiderman at our graduation from the Graduate Center, May 2013, Lincoln Center. Celebrating the 25th Anniversary of the Wick Poetry Program, with Rosemary Wiley, David Hassler, Maggie Anderson, Alicia Ostriker, Anele Rubin. with Suze Orman at the Books for a Better Life Awards.